Convertible car hire San Agustin Gran Canaria. We collect and compare prices from Gran Canaria’s leading rental companies. Our philosophy is simple, the best quality at the lowest price on your car rental. Our prices on hire always includes unlimited mileage, and all necessary taxes and insurances. Use the search engine below for guaranteed best price on convertible car rental San Agustin Gran Canaria in Spain. 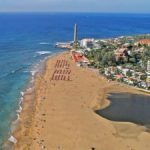 San Agustin is located on the southeast coast of Gran Canaria and the resort borders the larger Playa del Inglés. San Agustin was the first resort that was established in Gran Canaria in the 1970s, even before Playa del Inglés and Puerto Rico. San Augustin has retained part of its original character and charm. The resort is even one of the most luxurious resorts on the southern part of Gran Canaria. 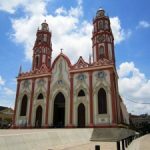 San Agustín become a favorite among visitors who no longer need to take the kids on vacation, and also among those who like to spend some time in the sun . It is not uncommon to meet Scandinavians who rent rooms or apartment over longer periods to get away from the cold winter in the north. Apart from a few large class hotel dominated San Agustín of houses buildings and smaller apartment hotel. The atmosphere is well established and peaceful, without major discos and bars that play so loud that it sounds far out on the street. And as to emphasize how homely it is here, is both the Scandinavian club and the Swedish church here, for those who want to meet people from home. 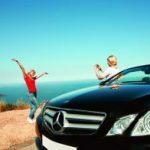 If you need car hire in San Agustin, its easiest to order the rental car online and pick it up when land at Gran Canaria Airport. Then you easily can return the car when traveling back to your home country, and you do not need alternative transportation to and from airport. In most cases, this is less expensive than using small local car rental supplier in San Agustin. Use the search engine above for guaranteed best price on car rental in San Agustin. Playa de San Agustín is a very relaxing beach, much quieter than Playa del Inglés and Maspalomas. Visitors who want to get away from the tribulation will love this dark-colored sandy beach – a place where you have plenty of space to breie you out, not to mention relax. It gets a little busier here at weekends when citizens use to have such a comfortable and quiet place outside the door. This beach is about 670 meters long, it has a slight slope and is well protected from the waves. This creates ideal conditions for snorkelling and diving. There are also some excellent seafood restaurants on the promenade, in addition to a selection of cafes, bars and shops. Shower facilities are just off the beach. Buses run to this place and there is a car there. 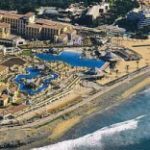 This entry was posted in Car hire Gran Canaria, Car hire San Agustin, San Agustin and tagged Car hire, convertible, gran canaria, rental car, San Agustin, Spain on 3rd February 2018 by Vera.